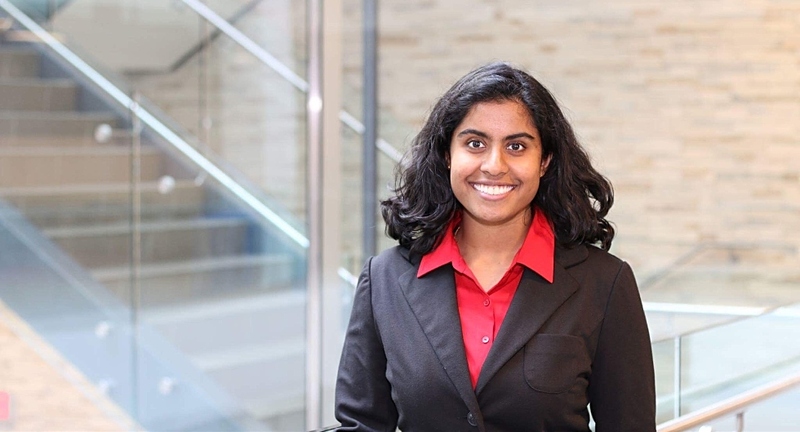 McMaster Global Health student Aloka Wijesooriya has been named a runner-up in a global competition that asked students to consider what a world where companies care and people come first could look like. It might, at times, be difficult to imagine a world where businesses are driven by social and environmental responsibility or where organizations place their employees and the wider world at the heart of corporate strategy. But for McMaster graduate student Aloka Wijesooriya, that world isn’t as far off as it may seem. In her video submission, Wijesooriya described her vision for the future, detailing a world in which people and organizations work collaboratively and respectfully to care for both the environment and society. She also identified the skills and approaches she says are needed to create such a world, stressing the importance of multilingual communication and conflict resolution skills, as well as the need to adopt a caring and open mindset that embraces diversity in all its forms. The Innovation Challengeis part of a partnership between global professional services firm, PricewaterhouseCoopers, and Universitas 21(U21), a leading global network of research universities of which McMaster is a member. The competition included submissions from students at U21 member institutions in Hong Kong, Singapore, Korea, South America, the United States and Canada. Wijesooriya qualified for the global competition after participating in the McMaster round, which was organized with support from the Office of International Affairs. As a runner-up, Wijesooriya, who graduates this spring, will receive personalized professional coaching sessions with the PwC Academy. “I anticipate that the coaching sessions will help me further develop my skillset and help me adapt into a future role within the global health field,” she says. Wijesooriya says, for her, the Innovation Challenge was a valuable opportunity to reflect on the kind of world she would like to create and encourages other students to think about how they can help build a better future. *The McMaster round of the PwC/Universitas 21 Innovation Challenge was organized by Tania Hakim, project officer in McMaster’s Office of International Affairs.